Once upon a time in Serendip (Sri Lanka) there lived a king whose favourite pastime was to bring cows from the jungle when there was a decline in their population in town. He sent strong people to the jungle who brought the cows under their control and took the animals back to town. Meanwhile, in the countryside of Serendip, there lived a poor couple. The husband died while his wife was into the third month of her pregnancy. Six months later, she gave birth to a boy. The child was barely able to crawl when his mother passed away. The poor orphan got lost and ended up in jungle while crawling. He found himself amid a herd of cows. He was fortunate enough to encounter nursing cow from which he suckled milk. Quite soon, the boy adopted cow's gait and started moving about on his four limbs. One day the elderly cows instructed the herd to pace forward. The child also ran as fast as could along with the cows. He heard a loud noise and saw a huge serpent moving from one part of the jungle to another. While the boy was growing among the cows, the king of Serendip sent some people to the jungle as the number of cows in the town decreased. The people were amazed to see the boy living with the cows and took the boy back with them. It took a year for the doctors to straighten his limbs. The king then ordered to teach the boy to converse in the language that the people used. After another year, the boy was taken to the court of the king. The king asked him whether the boy's parents were alive or not. The boy replied that the king had brought him while he was living with his parents. The king then asked if the boy saw any surprises while in jungle. The boy told the king about the serpent he had seen. The king, after listening to the story, said that the boy was like a flower in the jungle. The king then asked the boy to guide them to the cave into which the serpent had gone. The king of Serendip went with many of his subjects to the mountain that the boy showed him. However, no one dared to enter the cave, as they feared the serpent. The boy instructed to fill the cave with wood and to burn it. Even after setting fire to the wood, no one dared to go into the cave. The boy went inside the cow and returned with the sand and stones inside the cave. To everyone's surprise, the boy had returned with precious gems and stones. When he told that the cave was filled with them, there was no one who felt reluctant to venture into the cave. Soon the whole town was full of those gems and they stopped to bring the stones into the town. The king ordered his ministers and priests to the court and asked whether the treasure belonged to him. They replied that the gems were the property of the young adolescent Jangayyah Male'h Fadha Koi (the boy like a flower in the jungle). The king sought their advice on the possibilities of making the treasure his own. Some people advised that if there were no inheritor the state would receive the property when one died. Hence, they advised to kill the young man. Others suggested that if the king offer his daughter's hand for marriage to the koi (young man) then the goods would be the kings own. Hence, the king's daughter was married off to the koi. But the young man and the princess lived separately in two orchards. The priests were concerned about this and told the king that he did not have any rights over the treasure because of the existing circumstances. The king brought the koi and asked him how he could make the precious collection his own. The young man asked the king to build two ships from the riches of the collection and fill the ships with the treasure and assign slaves to the ships. The koi said that if the king do so then the rest of the collection could belong to the king. The king of Serendip agreed to the idea and built two ships. The ships sailed away with the koi and the princess. They sighted two little islands and after mooring at one island a tent was put up and the the royal couple stayed in the tent. The koi ordered the slaves to go to the next island. The koi named the island he and his wife stayed as Rasgetheemu. He dubbed the next island where the crew of the ships and the slaves lived as Alhugetheemu. When the koi had arrived to the island, people lived scarcely in the neighbouring islands. He invited them to a feast and killed them all. Thereafter, the ruler of the area was the Jangayyah Male'h Fadha Koi. Sometime later, the koi started digging the earth to make a pool in Rasgetheemu. The slaves who lived in Alhugetheemu did the work following the instructions of the koi. Oneday while the work was going on, the koi saw seven black-naped terns. The birds cried while flying over the island and then disappeared. The koi asked to stop the work immediately and told the slaves to go back to Alhugetheemu. After some days, the work of making the pool was resumed. This time five black-naped terns cried while flying over the island and then went away. When the birds disappeared, the work was halted again. After a brief interval of a few days the digging started again. Soon one tern appeared over the island, cried and then went away. The bird returned, circled the island, and cried. The koi took this as an omen and ordered to stop the work and to prepare the small batheli (a smaller vessel) of the ship for sail. Hurriedly, the royal couple and their slaves left the island following the tern. After several days and nights, the bird landed on the island of Dhoonidhoo in Malé Atoll. When the batheliWent near the island, the tern set off again and landed in the sandbank of Malé. 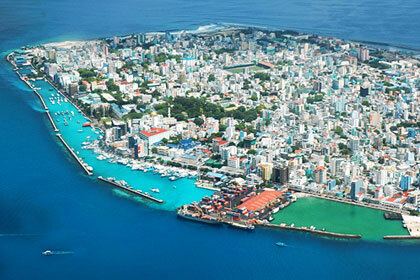 At that time, Malé was a small island, which could be more appropriately called a sandbank. There were some people in this island who were about to go fishing. The koi asked for their permission to settle in the sandbank. They were surprised that he wished to live in the small island, which they believed was not suitable for settlement. The fishermen, who were also from another island, told that they used to dump the waste of fish to this island. They said that there were more suitable islands in the vicinity that could be ideal for settling. However, the koi did not agree to settle in any island accept Malé. He and his companions set foot on the island with the permission of the fishermen. He then sent the crew to fetch the two ships in Rasgetheemu. Then he sent a letter to the king of Serendip requesting to send some people and goods to start a kingdom. The king of Serendip sent few people who were of the lion race. The koi had seen the king of Serendip practicing Buddhism. Hence, he and his subjects also adopted Buddhism as their religion and set up idol temples. Jangayyah male'h Fadha Koi, after proclaiming this Kingdom, declared that he was King Koimala. Surfing came to the Maldives in the late 70s. In 1973 Tony Hinde an Australian surfer took a break from surfing in Sri Lanka and together with a friend set sail for the Africa. He was never to reach his destination. His ship seriously off course was shipwrecked on the shore breaks of Male'. Tony discovered the thrill of surfing on the Maldivian reefs. He changed his name to Tony Hussein Hinde, married a local lady, opened his own surf agency and decided to stay for good. Today Atoll Adventures, the travel agency that Tony established, brings in surfers from all parts of the world to the Maldives. Thari Village, is reputed to be the best surf stop-over in the Maldives. The resort has access to two of the best surfs in North Male. Surfers are given accommodation at Thari itself and in the nearby resorts. If you want to surf outside of North Male' atoll, you will have to book a reservation on a live aboard. Pasta Point, is a long peeling left with exclusive access to Thari Village. Five miles away you find the Honkys and Sultans. Honkys is a long wrapping left and is reputed to be the best wave in the Maldives. Sultans is a right with barrels. The average size of reef breakers is 4-5 feet, rising to 8-10 feet during the surf monsoon. Surf monsoon is from late February to mid November, with the best waves coming in during March to May and then again in Sep till the end of November. Reef breakers are sometimes quite tricky to surf, the water is quite shallow on the surf and the coral beds sharp and protruding. Surfers are advised to bring all their equipment with them, as there are very few good surf equipment available. 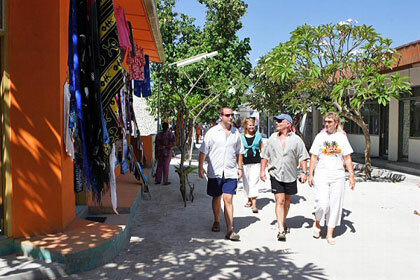 Both resort islands and cruising vessels known as liveaboards offers excursions in Maldives.A visit to the capital island Malé can fulfill your shopping needs and offer many sightseeing attractions. An excursion to an uninhabited island can be a good Robinson Crusoe experience. The seclusion and untouched beauty of these islands even attracted visitors who crossed these seas even in the past. For a better insight of the local life, an excursion to an inhabited island will be ideal. You will see the fishermen at work, the children enjoying themselves and the women busy with their chores. Some of the islands even have souvenir shops. Fishing trips are also very entertaining. Apart from learning local fishing methods you can even have the fun of night fishing and big game fishing. A barbecue at the beach is often the sequel to such trips. The Maldives has been an Islamic country since 1153 and the Islamic festival of Eid has always been an important event for the people. Even in the days of the monarchy, special customs were followed in the Eid. It includes special drumbeats from 'Nabuskhan', a place where special events are announced with drums, and the official procession of the Sultan to the Eid prayer. This procession was accompanied by music and military displays. In the islands special games are played. People wear new clothes and are in a festive mood. Through the times the customs of celebrating the Eid have changed. 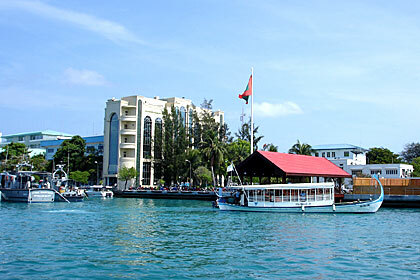 Now you can see western and modern music shows held in Male' and other islands. In addition brass bands, cadets of schools and National security service holds parades out in the streets. The traditional games are also now revived including baibala. There are two Eids for Muslims, one after the fasting days of Ramazan and the other after the Hajj pilgrimage to Mecca. The various cultural events associated with these two Eids vary and are also different from island to island. If a visitor wish to see traditional events held during these Eid festivals, a local island would be the ideal one to visit. The circumcision of small boys is celebrated. Usually the boys are circumcised in the annual school holidays. The houses are decorated and music is played. Many people visit such houses mainly to enjoy a game of carom or participate in the local bodu beru and listen to a local band perform. It is quite often that you will find some form of powder or spray ruining your clothes. The Maldives became a British Protectorate in 1887. The British made an agreement in which they pledged not to interfere with the internal affairs of the Maldives, while on foreign affairs the British were to be consulted. In return the British assured of security and protection from any colonial intimidation. On 26th July 1965, full independence was granted to the Maldives. Maldives celebrates its Independence Day on 26th of July. Special celebrations include parades by the National Security Services and the school children. A Portuguese fleet attacked Male' in 1558. The ruling Sultan Ali 6th fought against the invaders with little support from his fellow countrymen. He was killed in the fighting. He is hailed as a national hero and declared a martyr. He was killed on 1 Shauban 965 A.H. (Islamic calendar). Every year 1 Shauban is marked Martyr's day in the memory of Sultan Ali 6th. After the Portuguese invaded Maldives and killed the reigning Sultan in 1558, the Maldives was under Portuguese colonial rule until Muhmmad Thakurufaanu liberated Maldives in 1573. He and his companions arrived on Male' on 1 Rabeeul Awwal 981 A.H. (Islamic calendar) and ended the colonial rule of fifteen years. Now 1 Rabeeul Awwal is marked the National Day. 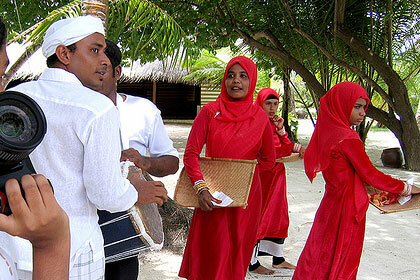 Parades and root marches are held in the streets of Male' and other islands on this day. In 1752, in the third year of the reign of Sultan Mukarram Muhammad Imadudheen 3, a South Indian expedition captured Male', took the King with them and destroyed the palace. This occurred on 13th Safar 1166 A.H. (Islamic Calendar). Some of the invaders remained, controlling the Maldives. Within four months, Maldives regained its independence under the leadership of Muleege Hassan Maniku, who was later to become a Sultan named Hassan Izzudheen. This national hero, a descendant of a family from Huraa, Male' Atoll, liberated Maldives on 3rd Jumadhul Akhir 1166. Hence, this day is marked as Huravee Day. The 12th of Rabeeul Awwal in Arabic calendar ismarked the Prophet Muhammad's Birthday. Traditionally, it was a very important day in which Malood, Arabic verses praising the Prophet, were sung. Special foods including aweli were made. Even today, some households offer special prayers and prepare special food for the occasion. It's a public holiday. After hundreds of years as a monarchy, the Maldives became a Republic on 1 January 1953. However, this Republic was short lived. A monarchy was restored within the same year after turbulent politics. A Republic was formed again on 11 November 1968. The Republic Day falls on 11 November. Parades on streets and special events are held on this day. A terrorist group attacked Male' on 3 November 1988 and tried to overthrow the government in an attempted coup. However, they fled the country after their attempts failed. Victory Day is marked on 3 November. A partial solar eclipse will occur on the 15th of January 2010 from 10:15 HRS to 14:23 HRS. And the maximum it can be seen at 12:25 HRS.